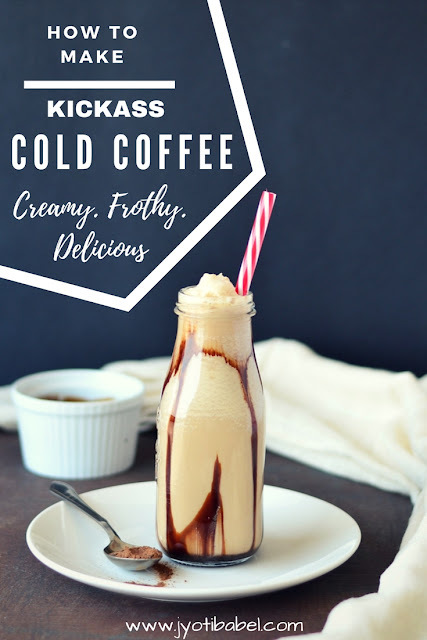 Creamy, frothy and super delicious, this cold coffee recipe is a must try if you are a big fan of cold coffees, just like me. I think it was during my college days in Guwahati that I came to know about cold coffees. A Cafe Coffee Day outlet had opened up in the city and it was one of the to-try places to hang out with friends. I remember how I used to save some bucks from my pocket money every month so that I could splurge on a tall glass of cold coffee with chocolate sauce and a scoop of vanilla ice cream. It used to be a special visit, a once in a while indulgence. My love for cold coffees never diminished. Even now, I like to indulge myself at cafes whenever I am in the mood. When I started cooking myself, I realised it was simple to make cold coffee at home. But the thing is if you want it rich and frothy, you must not count the calories. No skinny cold coffee can match the taste I am after. So, when I make it, I make it the best way, nothing less. The good thing about this recipe is no special ingredients or equipment is needed. I use Instant coffee by either Nescafe or Bru, both work fine. A scoop or two of good quality vanilla ice cream is a must for the creaminess of the coffee. You can definitely adjust the sugar as per your taste buds. I use chocolate syrup for streaking the glass and sometimes as a garnishing. A very good friend suggested me to try adding Bournvita powder along with coffee. I tried it and kind of liked it. So, whenever I have Bournvita powder at home, I add it to my cold coffee. It's optional, if you like it, add or else leave it. 1. In a tall mixer jar, add chilled milk, a scoop of vanilla ice cream, sugar, coffee, Bournvita powder ( if using) and ice cubes and blend it. 2. Give it a whiz 3-4 times for 2-3 minutes with a minute break in between to ensure that the ingredients are well blended and sugar is completely dissolved. Drizzle little chocolate sauce inside a tall glass. 3. Pour it into the prepared tall chocolate sauce streaked glass. Top it with the other scoop of vanilla ice cream and chocolate sauce. 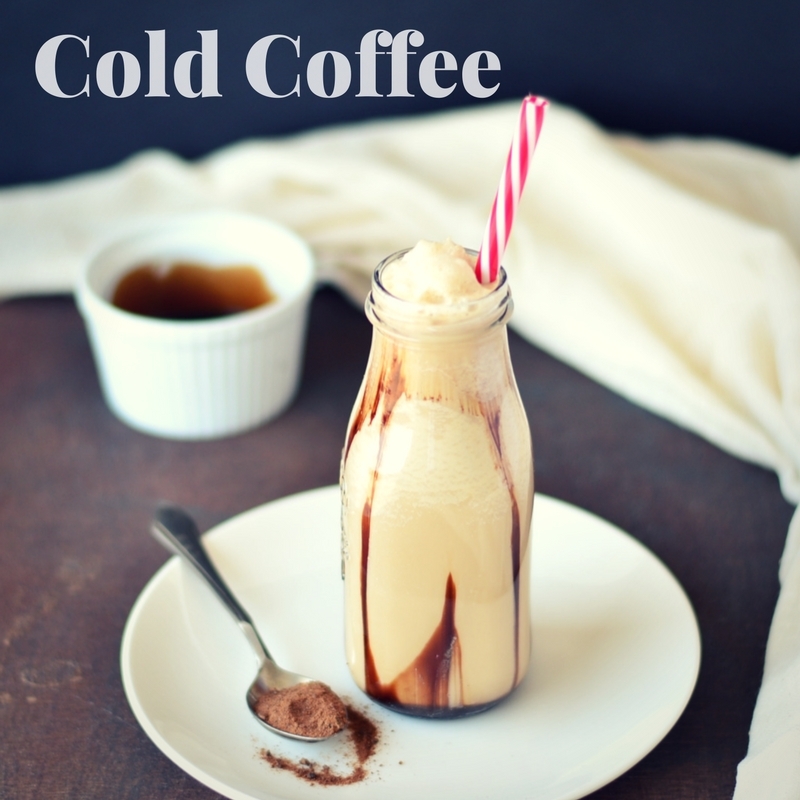 Some other coffee ideas (both hot and cold) from my blogger friends that you can check out. 1. You can definitely use filter coffee concoction instead of instant coffee granules. 2. If you do not have vanilla ice cream, add 1/4 cup or little more cream and up the sugar to taste. 3. It is calorie rich and sugar high drink, so exercise caution and indulge in it once in a while. Delicious cold coffee Jyoti. Love it and make it often. I add cocoa powder instead of bournvita. Bournvita sounds like a good idea. Thanks for including my recipe link. Cant ask anything more, absolutely irresisitble and this creamy cold coffee rocks. Tempting to the core Jyoti. Catchy clicks as well. It looks just like directly from the Cafe Coffee day. Yummm! Perfect summer drink. I am a huge coffee lover. My hobby is coffee I can say!will try this soon. Love this type of creamy rich cold coffee. Adding bournvita is a great idea. I will try next time. Awesome click. Superb cold coffee. The Bournvita is an inspired idea! Cool and refreshing for this time of the year .. summer specials. You are right, some things taste best when we make them without counting calories. This sinfully delicious cold coffee seems worth every single calorie! Lovely presentation too! Fabulous share, just in time for the scorching heat beating down upon all of us! Coffee with cocoa, match made in heaven. I could gulp this down any time! While I love my coffee hot always, my husband likes to drink cold coffee once in a while. From the recipe I can see it will taste exactly like the CCD style for sure. Great styling and the cold coffee does look super tempting. Lovely drink for summer. It's refreshing, let go off those calories once in a while. My daughter is a great fan of cold coffee, she prepares now and then! Yours looks simply awesome and irresistible drink! I love cold coffee, especially in summer. This looks creamy and yummy! 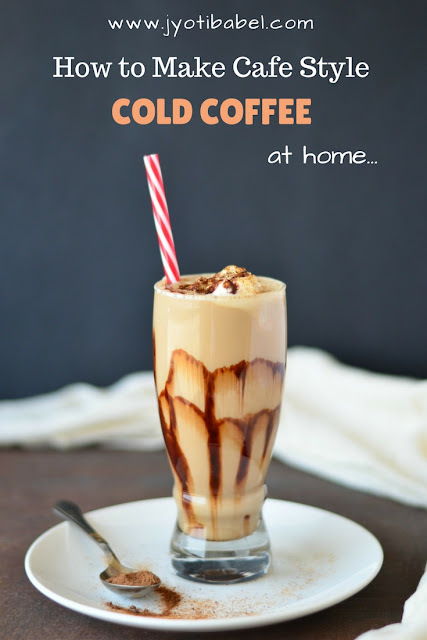 We love cold coffee in hot summer days and this looks just amazing. Love the way you captured the pictures. Summer is making its presence felt. Nothing better than a tall glass of cold coffee to ward off the heat! Now that I know from you post that its easy-peasy, I so look forward to making this and surprising every one at home. Thanks Jyoti fro sharing this one. A cold coffee is my first love. Thank you for the awesome recipe buddy, I definitely see I can improve mine now thanks to your inputs. Perfect share for these hot days !! !